Here we have yet another entry in the “I need to charge my gadgets on the road, but I hate carrying a bunch of cords that get tangled worse than the cables underneath my desk” market. This one is really pretty neat, and has officially made my short list of must-have gadgets. The clipSYNC is a pocket-sized charge and sync cable which includes a carabiner clip so it’s easier to keep track of. The cords themselves retract into the body, eliminating that spaghetti-like tangle at the bottom of your bag. With the carabiner clip, you don’t even have to put it in your bag, you can clip it to the handle or zipper pull for easy access without having to dig for it. 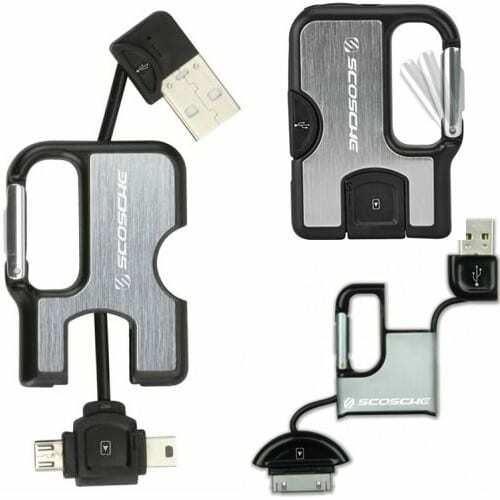 It is available in two versions: one for iDevices which features a USB connector on one side and a 30-pin connector on the other; and one for Android devices which features a USB connector and a mini USB connector. What’s really nice about this is you can also sync devices together while you charge them. At just $19.99 US, the clipSYNC is pretty much the textbook definition of the perfect stocking stuffer for every technogeek on your gift list.